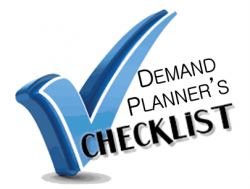 Embarking on a demand forecasting project is usually a somewhat frightening challenge especially if you were the one pushing for the change. The cost justification for the project may have been aggressive and the expectations may have been set a bit high to get the project launched – it’s all part of the game sometimes. But if you didn’t do so during the justification phase, here’s a high-level checklist that can help ensure the success of your demand forecasting initiative while putting your career as a demand planner in the driver’s seat ― not under the wheel! Establish Goals and assess the value of improvement – Usually this is covered in detail to get the project approved, but it never hurts to clearly reiterate the goals of your forecasting project to all interested parties to set the bar where it belongs. Setting expectations and consensus building – Expectations must be set and agreed upon in an informal way during the consensus building process. This should occur both pre-launch and while building the team since the project will most likely be interdepartmental. I have found that consensus comes a bit more easily if you can point out the specific value to each team member (e.g., what’s in it for them) before the work begins and demands are placed upon them. Data gathering and data integrity – Now the meat of the project begins, with data availability and integrity the first large hurdles to overcome for the project team. Forecasting data should have been researched during the analysis phase, but sometimes this is not done at the level of detail needed during the actual project. Data availability and integrity are the first real milestones on the check list that must be taken very seriously. Here is the beginning of the process of finding and correcting errors in demand, which is sometimes called cleansing or outlier detection and correction. Establish a measurement methodology – As the project progresses during the early phases it is good to start establishing the ground rules for measuring forecasts and the improvements that will be obtained. These measurements such as MAPE, MAD, etc. seem obvious to many people but a careful review of the method and the level of detail is important in order to truthfully assess the impact of the new process. The conventional measurement methods may not always apply such as MAPE, COV or Bias. Understanding demand influences – Part of this task involves doing a deeper analysis of the source data and filtering out inappropriate influences such as a company acquisition or a recent loss of major customers that can’t be replaced. In essence you may have to transform historical demand to use it effectively in the forecasting process. Demand classification/SKU segmentation – Usually “the elephant has to be eaten one bite at a time” so 90/10 or 80/20 classification of SKUs to determine the largest impact that can be produced with the highest degree of accuracy is a prudent step early in the project. This helps the project review team to see the value of the new process early on. Testing concepts – This of course is an obvious step and has to be handled carefully so it doesn’t fall into the trap of paralysis by analysis. Frequent reviews by the project team can serve to control the extent of this task. Continuous improvement plan – Demand forecasting is a never- ending challenge and dynamic by its very nature. That implies that with careful and continuous measurement a process can take place to both improve the accuracy and the efficiency of the forecasting process. With the use of proper tools and technology this step is much easier to accomplish. Forecasting projects can be expensive and sometimes disruptive but the rewards can be huge to both your company and yourself as the project lead. Of course (and unfortunately), the reverse is also true.